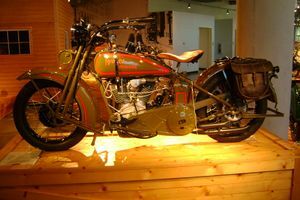 The Harley-Davidson single camshaft JD model was a high performance machine that outsold every other Harley model between 1923 and 1929. 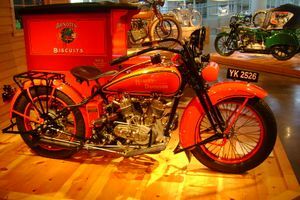 But by 1929 Indian and Excelsior had established the suitability of side-valve motors in terms of performance and production costs, so Harley discontinued the "J" series to concentrate on side-valves. The pocket valve era was over. In the early years of the 20th century, America exported a great number of motorcycles to all parts of the world. This 1925 Harley went to Australia, and attached to a box sidecar, delivered cookies in Sydney, New South wales. Refurbished in the 1990s it was used for publicity purposes, and the shelves in the delivery box are still stocked with "biscuits". This page was last edited on 11 August 2010, at 00:54.